In this article we will touch on the importance of grain marketing and also identify strategies that farmers can use to put together their own marketing plan. Marketing is the performance of all business activities involved in the flow of goods and services (in this case maize) from the point of initial agricultural production until they are in the hands of the ultimate consumer. It is important to note that groups with different interests will view marketing differently. Consumers want their products at the lowest possible cost, while farmers want the highest possible return. This may lead to conflict between producers and consumers, or in this case, the maize miller. Both maize producers and millers are exposed to a volatile market affected by many factors outside their control. There are various tools and marketing strategies for both farmers and millers to hedge themselves against these price fluctuations. Developing and implementing a comprehensive marketing strategy is a critical step towards establishing a profitable farming business. A marketing strategy will help you make rational marketing decisions, allowing you to manage price risk and improve market returns. In order to market successfully, a farmer needs to stay informed and remain flexible. Profit margins are continually being squeezed and the people who manage their risk are going to be the ones left standing. In order to have a diversified grain-marketing plan, one has to be able to change with the markets. Marketing does not just start from the point of sale. Sticking with a pre-set marketing plan in a disciplined manner is critical to avoiding unnecessary price risk. Staying informed about the market will help ensure access to information needed to take advantage of price movements. The marketing plan should also be reviewed and revised on a regular basis as supply and demand conditions change. The advantage is that the producer can share in price increases later in the season due to supply and demand factors. However, the disadvantage is that there is no form of price risk protection and the cost of storage; grain handling and interest are a big factor. A forward contract can be seen as an agreement between two parties to buy or sell any kind of asset at a future point in time. The advantage is that this strategy helps to control and hedge price risk. Depending on the kind of contract, the downside is that a farmer does not share in the benefits of favourable price movements. The farmer will also be liable to deliver the hedged quantity to the buyer, which increases the farmer’s vulnerability towards production risk. The benefits of having one’s own silo is that you do not have to pay direct storage costs and as a producer you can share in price increases later in the season if demand and supply factors work in your favour. On the other hand, the obstacle is having enough capital to build a silo. 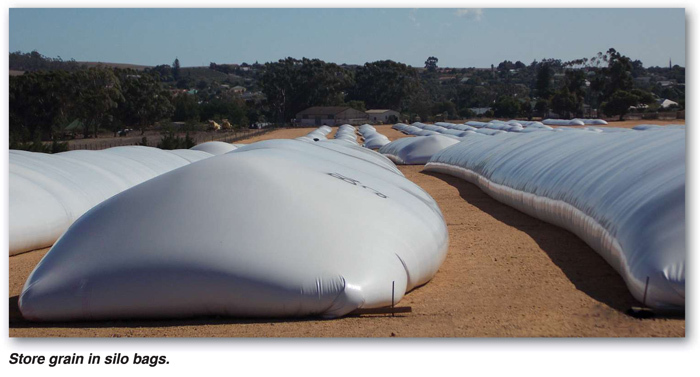 The advantage is that a farmer gets to save on storage fees and capital for constructing a silo as the silo bags are cheaper than permanent structured silos. The producer can share in the price increase, when supply and demand factors are favourable. The risk with storage bags is quality deterioration of the grain when stored for extended periods. The upside is that the farmer can control and hedge price risk. The downside is that hedging costs a certain amount of money in order to make use of futures and options. Farmers who do not feel confident to trade on the Futures exchange (Safex) hire traders, which costs a fee. For those who do not want to store their grain, they can follow this strategy. They sell their grain on the spot market as soon as they harvest it and buy futures in order to stay in the market. The advantage is that the farmer can still share in price increases and they do not have to pay any storage fees, they are also able to repay financial debt quicker. The disadvantage is that if the market turns around and prices decrease, then the farmer makes a loss, which can have a negative impact on a farmer’s cash-flow. 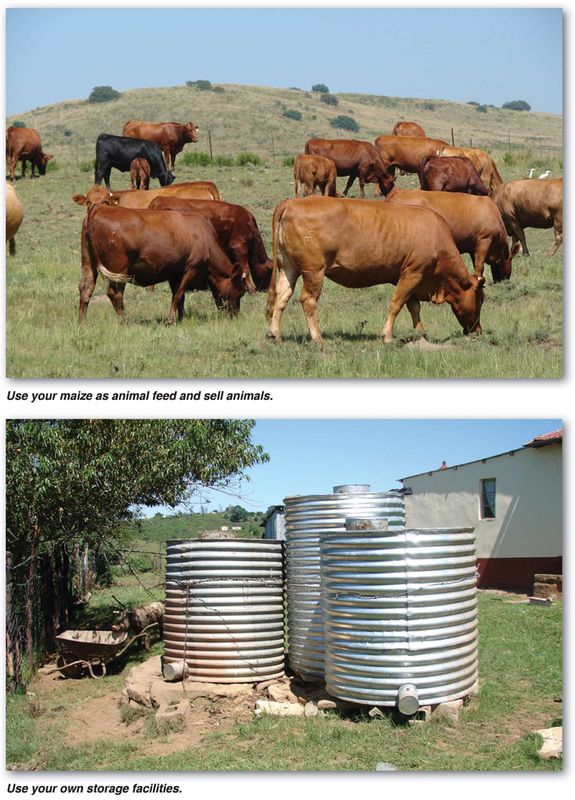 For farmers who have both animals and crops; taking into consideration the animal feed transferring ratio, one can decide if they want to sell their maize or feed it to their animals during low maize price years, rather earning money from their livestock. The disadvantage is that meat prices also fluctuate, so it is no guarantee that meat prices will be sustainable during low maize price years. iHedging is one means of reducing risks in the commodity market with the commodity futures exchange markets. Like the use of car insurance, to hedge the potential costs of a car accident, agricultural producers can use the commodity futures markets to hedge the potential costs of commodity price volatility.